When I got this stamp set back in January along with my new Idea Books, this was the first stamp I wanted to play with! I've got three cards to share with you today. One of these cards I made way back in January. This card is a 4 1/4 x 5 1/2 card. The base of the card is our Kraft cardstock. 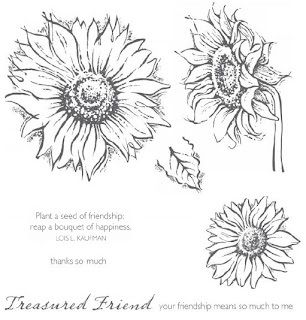 I stamped the flowers with Cocoa Ink. 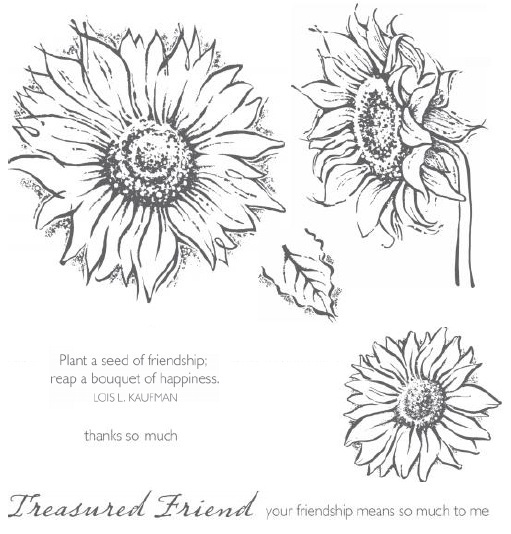 To color my sunflowers, I used the waterbrush and ink from the pad. I squeezed the pad together while it was closed to get ink onto the inside top cover. Then I used the waterbrush to pick up the ink and painted it onto my flowers. I LOVE this Cocoa Striped Ribbon with these cards. Notice my delicate Bitty Pearls at the bottom next to the sentiment? Here is another 4 1/4 x 5 1/2 card. For this card, instead of using the waterbrush and ink, I colored the flower with watercolors pencils. Then I blended the colors together with the Blending pen. I used the Art Philosophy Cricut Cartridge to cut my scallop ovals for the sentiment. I added Mocha Bitty Pearls and again used the striped Cocoa ribbon. My last card was actually the very first card I made back in January. 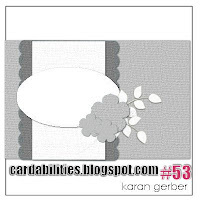 This is a 6x6 Kraft Die Cut Card (Z1474). I used the watercolor pencil/blending pen technique for these flowers. Here, I added the large Opaque Adhesive Pearls. I hope you enjoyed my cards! Don't you just love this stamp? Remember, you can only get it during the month of May! With a $50 purchase you can get this set for just $5. Now hop over to Susan Brook's blog and see what she has created! I love this week's Mojo Monday sketch! I've been busy but all I could think about was making a card with this sketch using my Dotty For You paper! It's a good thing I've got 2 packs of this paper because I just can't get enough of it! I needed to make 2 cards for 2 dear ladies. First, my grandma, who was so excited to get my card last week. I wanted to send her another one this week to keep her spirits up! The 2nd card is for another dear lady that is the grandmother of my daughter's friend. She comes to every softball game near and far. Last weekend as we were leaving a tournament in Alabama, she fell. It was a scary moment for all of us. They called the ambulance to take her to the hospital and as we waited for them to take her away the team circled together and prayed. That was a very touching moment and I'm sure it meant alot to her granddaughter. I checked on her yesterday and she is doing ok - but is pretty banged up. She wasn't able to come to the game the other night. I thought it would nice for the team to all sign a to cheer her up. I used the Butterfly pattern paper and the Dotty sided paper for this card. I cut each square at 1 1/2". For my flowers, I used the Art Philosophy Cricut Cartridge. I cut each flower at 3", 2 1/2", and 2". I used a Sunset button with baker's twine from the Baker's Twine Paradise Assortment. The butterfly is cut from the same pattern paper as the butterfly squares. For this card, I used a variety of papers from the Dotty For You paper. This time, instead of making a big flower, I cut a scallop circle with the Art Philosophy Cricut Cartridge at 3". Then I cut 2 circles 2 1/2" and 2 1/4". This time I cut a yellow butterfly from the pattern paper. I used a tag from the Lagoon Mini Medley accents (now retired) and attached a flower from Just Blooms Flowers Paradise collection. I tied the tag with more baker's twine from the Baker's Twine Paradise Collection. The sentiment is from Card Word Puzzle - Sympathy. Inside the card, it says "are coming your way". Ok, are you in love with this paper yet? If so, you want to be sure to get it while you still can! 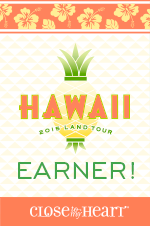 It is only $5 for 24 sheets of paper (2 each of TWELVE designs!) One the back side of each pattern is a dotted pattern in either Grey, Buttercup, Pear, Smoothie, Lagoon and Sunset. To get this special pack just spend $35 in Close To My Heart Products and add the Dotty For You pack for only $5! This paper is only available through May 31 or WHILE SUPPLIES LAST! Don't miss out! My dear sweet grandma had a minor stroke on Saturday. My grandma, who is a very fiesty 94 years young (almost 95) has not let that stop her! The stroke left her with little use of her right arm and left leg (very unusual - but she is not your usual Grandma!). By Sunday morning she was complaining that "All this deal, test, and stuff was making her miss her breakfast and that she wanted some bacon and eggs and a cup of coffee!”. She promptly got her breakfast and ate every bit! On Tuesday, she was moved to Rehab but before she left they had her up and walking with a walker! Go GRANDMA! She'll be walking out of there in a week's time I bet. Here she is with the basket of flowers my sisters and I sent to her. Isn't she the cutest? I wanted to make a cheerful card to send to her to let her know that I was thinking of her and praying for a fast recovery. I pulled out my Dotty For You paper and chose the piece with great big circles on it. I cut out some of the circles for a design I had in my head but couldn't get the circles to work the way I wanted. I ended up with something completely different! The circles just kind of pulled themselves together to form a big flower! I cut the green circle in half to form the leaves. The H2H challenge this week was to add a bit of stitching so I hand stitched the yellow twine onto the center of the flower. (I was going to stitch each petal too but by hand that was just a little too much for me! haha) It was getting late and I sure didn't want to pull out my sewing machine. That might have prompted my family to think I up for doing some mending! 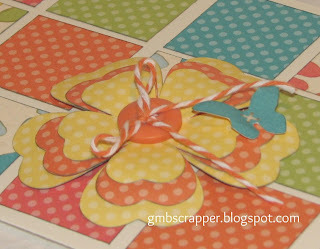 I cut out a couple of butterflies from one of the other pieces of my Dotty For You paper. Look! There is a stitch on each butterfly that looks real! That is what I love about this Dotty For You paper, it looks layered and dimensional but take a second look, it is only printed! I added some Opaque Pearls to the center of my flower to finish my project. My sentiments "Just a note to Brighten your day" is from the set Card Chatter - Sympathy (D1476). Inside the card it says "And Chase the Clouds Away". Twine is from Baker's Twine Paradise Assortment (Z1702) and the pearls are from the Opaque Pearls Adhesive Gems (Z1336). when you spend $35 in Close To My Heart Products! Appreciate with Dotty For You! Due to a rained out game tonight I got to come home and spend some time in my craft room! YIPPEE! I've missed it lately. Last weekend the high school softball team played in a tournament near the hometown of their coach. After the games on Friday evening, the coach's parents graciously opened their home to 4 coaches, 19 VERY DIRTY girls AND their parents and prepared a HUGE home cooked meal for everyone. The team and coaches spent the night there and got to eat breakfast before heading out to their next game early Saturday morning. I wanted to make a card for the team to sign in appreciation for all their hospitality. I couldn't wait to use this piece of the Dotty For You paper! 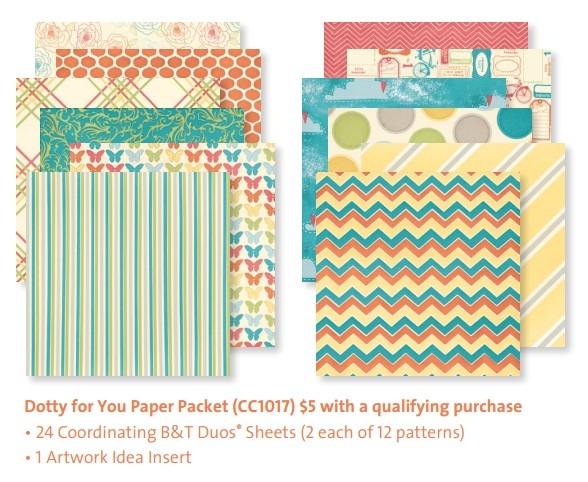 The Dotty For You paper is our National Scrapbooking Month special that you can get for only $5 when you purchase $35 in Close To My Heart Products! Read all about this special on my Dotty For You Tab. I used the Art Philosophy Cricut Cartridge for the ovals, cutting the Cocoa cardstock at 1 1/2" and the sentiment at 1 1/4" <Oval2> . The stamp is from the February Stamp of the Month - Thoughtful Tidings which is no longer available. I also used the Art Philsophy Cartridge to cut my leaves at two different sizes - 3" and 2" - using the <Branch2> setting. 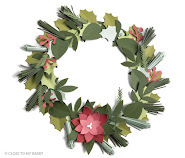 The paper flowers are from the Just Blooms Paradise Flowers (Z1710). 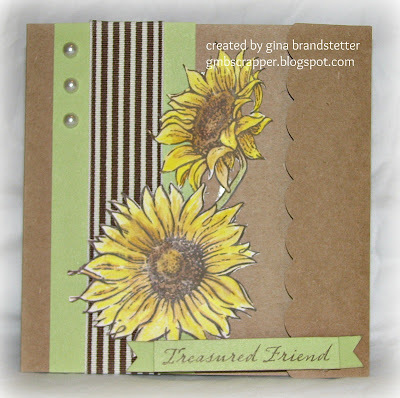 Next I added Opaques Mocha Adhesive Gems (Z1333) for a final touch to the card. Did you know that May is National Scrapbooking Month? I love National Scrapbooking Month because Close To My Heart always has a really cool special that I just can't pass up! You won't want to pass this up either! Beginning today, April 17, you can get the special Dotty For You paper pack for only $5 when you purchase $35 in Close To My Heart products! What is Dotty For You? It's an EXCLUSIVE National Scrapbooking Month special that is available ONLY from April 17 to May 31. This pack has 24 sheets of beautifully designed B&T paper (2 each of 12 designs). Each design was either hand stamped, or designed using shapes from the Art Philosophy Cricut Cartridge by our Close to My Heart artists and then printed. The colors are vibrant and bright. On the opposite of each sheet is a dotted pattern. Mix and Match! They are all beautiful! Want to be inspired by this pack? You've come to the right place! Hop on to our Dotty For You blog hop hosted by over 30 Close To My Heart Consultants! 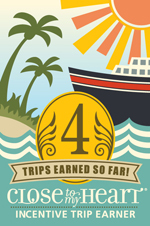 If you came here from Jamia Bankhead's Blog, you are in the right place! I've created several things in the past few weeks with this paper and I'm not done yet! Today, I'm going to share with you a card and layout that I made. When I saw this piece of paper in the pack, I knew immediately that I wanted to create a layout with it. 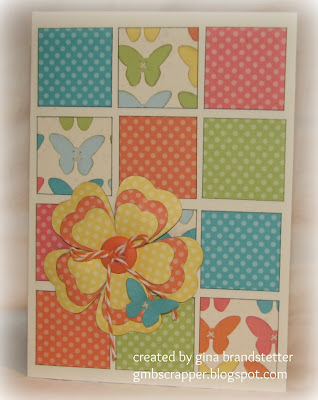 I used the Smoothie Zig Zag print and the Sweet Leaf Dotted paper with the Plaid piece as my base page. I used the Art Philosophy Cricut cartridge to cut the flowers. My accents (Buttons and frame) are from the Mini Medley Accents Smoothie Collection. The title - "family" is a stamped using the new Keepsake Alphabet (E124). I love the way this alphabet stamps to look like a handwritten word! Here is a closer view of the flower - I used the Sweet Leaf and Buttercup dotted paper along with Smoothie Cardstock to make the flowers. Each flower is cut 1/4" smaller than the previous flower. For this card I used one of our new 3 1/2" x 8" Colonial White die-cut cards (Z1738) and one of my favorite stamps - Just For You (B1398). 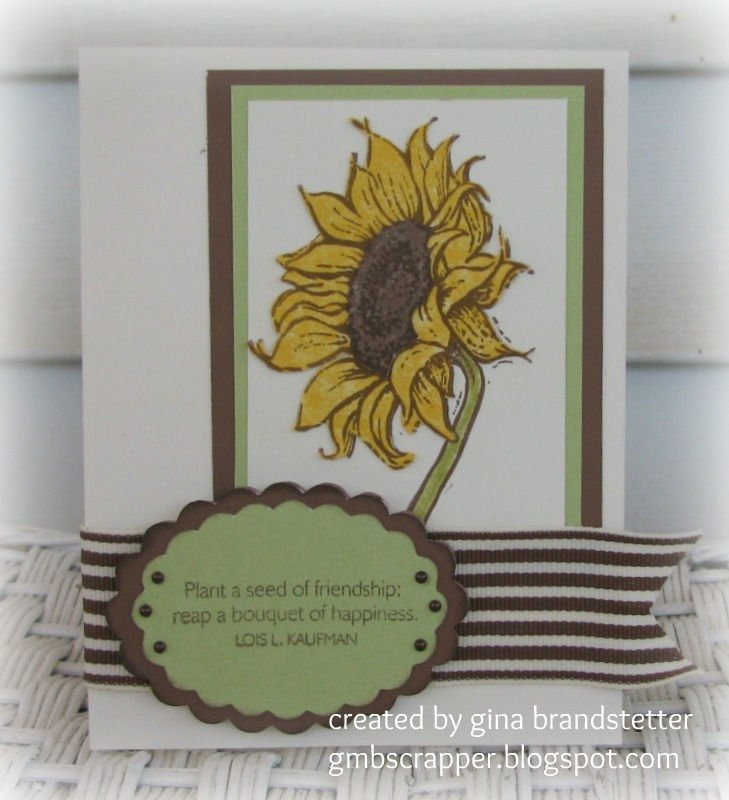 I stamped the flower with Sweet Leaf, Lagoon and Grey Wool ink. I added green sparkles from the Sparkles Blue and Green Assortment (Z1327) for a bit of bling. Don't you just love this paper! Get it today! 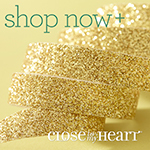 Go to my website and order $35 in Close To My Heart products and then add the Dotty For You paper for only $5!. Start Shopping HERE! Need more inspiration first? 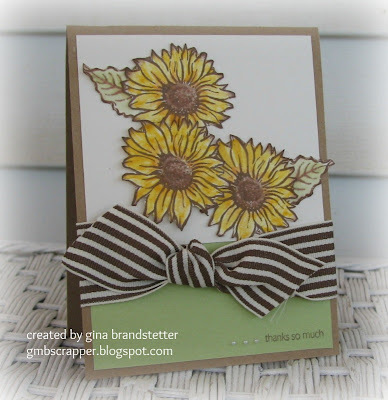 Hop along to Cassandra Bennett's Blog and see what she has created for you! The Close To My Heart Convention is coming up in July and takes place in Dallas, Texas. 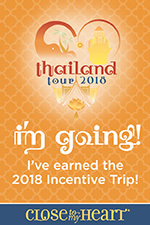 This will be my third convention. I love attending convention because the excitement is so electric! Each convention, I look forward to seeing all my sister consultants that I have formed close bonds with. There is nothing like it. 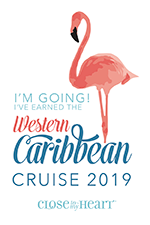 I'm so excited about it, I've got a little countdown badge over to the right! Plus I'll be teaching this year! YEE HAW! - Even MORE excited about that! 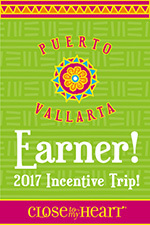 Corporate sent out postcard reminders to all consultants to remember to sign up for convention. Then they challenged us to use that postcard to make a layout! I had pinned mine to my bulletin board and then got busy and forgot all about creating a layout. Yesterday, another consultant posted her layout (which was awesome by the way) and I started thinking I really should try to do something. Last night I had one of those moments ..... where an idea just comes to you. I couldn't wait to get in my scraproom and put the idea on paper. And I knew JUST the paper I wanted to use! This piece from the Dotty For You paper collection of Sunset shapes was perfect! I used a strip of Lagoon dotted paper from one of the other pieces in the pack. PERFECT! I used Buttercup and Cocoa cardstock to cut out my stars using the Art Philosophy Cricut Cartridge of course. The stars are layered using foam tape. Each year at convention we see so many new products unveiled, it takes your breath away trying to soak it all in. I put a lasso (made from our Natural Hemp (Z280)) around a couple of stars because this is how I will feel at convention.. I will want to get my hands on all the new products quickly and since our convention is in Dallas I thought "Lasso around the Stars" was appropriate! To finish off the page I added Pewter Badge Buttons (Z1704). These are adhesive back and make it very easy to apply to your pages. 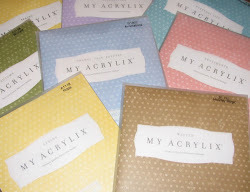 The Dotty For You paper is our special paper celebrating National Scrapbooking Month in May. But you can order your pack as early as April 17. (That is next TUESDAY). 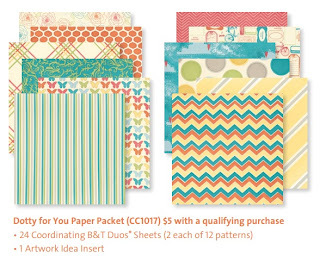 And the best deal of all - just place a $35 order of Close To My Heart products and you get this paper pack (24 sheets - 2 each of 12 designs) for ONLY $5!! How Awesome is that? To see more about the Dotty For You check out my special tab at the top of this page HERE. Be sure to come back to my blog next Tuesday, April 17 and join in on the Dotty For You Blog Hop fun! 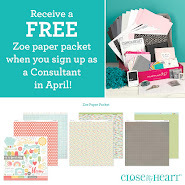 You see lots of ideas for this paper pack by over 40 Close To My Heart Consultants! I received some VERY exciting news yesterday which came at the end of what has been a very stressful week at work. If you read my previous post, I mentioned that this past week has been all work and absolutely no time to play! It is our year end closing at work and I've been working some very late hours - not getting home until nearly 10:30 or 11:00 each night. Then it's back to work by 7:30 am for more. Yesterday, although it was Good Friday and everyone else got the day off, my department was still trudging along trying to get our entries done. Late yesterday I received an email from Close to My Heart that I had been selected to teach at this year's convention in Dallas! I was so excited I began jumping up and down with squeals of joy. Some weary accountants looked up from their desks wondering what in the world I could be so excited about! Back in February I had carefully boxed up my submission - 2 layouts, 2 cards and a "Create" Banner (the one across the top of this blog) and mailed them off along with an application and link to a video I created. This was my first time applying. I thought my chances were slim - there are so many talented consultants out there! The application deadline was March 1st, so when April 1 came and went I decided I had not been selected. I told myself that I would just try again next year. But deep down, yes, I was a little disappointed because it was something that I really want to do. Yesterday I had an email in my inbox title "Extravaganza Application". I thought this will be the "Thank you applying but.....". Imagine my surprise to read the first words - "Congratulations!". That is when I started squealing! I had so much fun creating this layout with the Pemberley (X7148B) paper pack. I used the sketch - "Out of the Hat" from the How To book - Magic for my layout. This is one of my favorite layouts because I love the slanted angle. The adorable subject is my friend's daughter being pushed in a swing built by her grandfather. He is in the larger picture to the right. You can tell she is loving the swing! When I was talking about the pictures with my friend she said these were some of her favorite pictures. She said it looks like her daughter is thinking "I'm happy to the tip of my toes!". That was it! The PERFECT title. I used words from the Card Word Puzzle (C1418) stamp and then letters from Trinity Alphabet (E1021) to create the title. I added the Color Ready Garden Wooden Shapes (Z1718) which were perfect for this layout. Here I used more of the Color Ready Garden Wooden Shapes. This time I sponged ink on them for a little color. Mocha Pearl Adhesive Gems (Z1333) accent the centers. "Gaga's Swing" was cut and matted using the Art Philosophy Cricut cartridge. I used the Classmates Alphabet (D1303) for the title. My little hexagon border is cut from one of the Pemberley B&T papers. The raised flowers are cut from the same paper and adhered with Foam tape to every other shape. I used the new Durables Round Studs (Z1706) for the centers. Now I can say I too am "Happy to the Tip of My Toes" after yesterday's news! I'm honored to be teaching along side of some of the best artists and crafters at convention this year! I am MIA this week due to Year End closing activities at my 'other - not so fun' job this week. Oh how I yearn for time in my scrap room. A room with no deadlines, no stress and just pure enjoyment. Oh well, maybe next week. 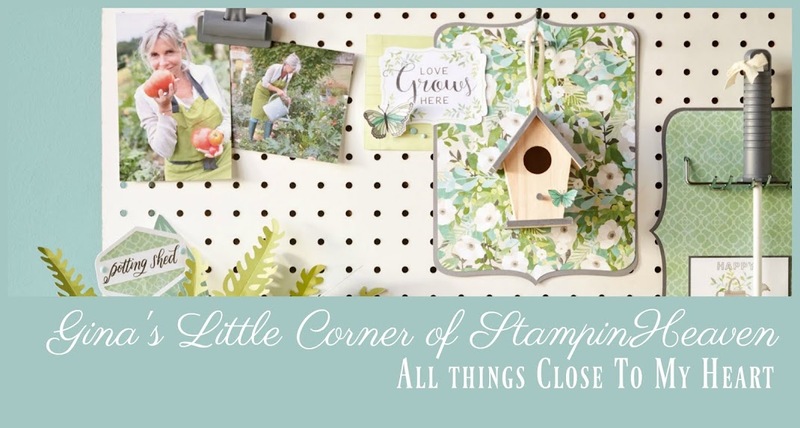 Since I don't have time to create anything, and I don't want to leave you hanging looking for ideas, I thought I'd post this quick little video from Close To My Heart that shows ideas for the Crafted With Love Stamp Set (B1399). This stamp is great for adding your own 'signature' to the back of your artwork. Here, this video shows how you can bring this stamp 'Front and Center' to your art.